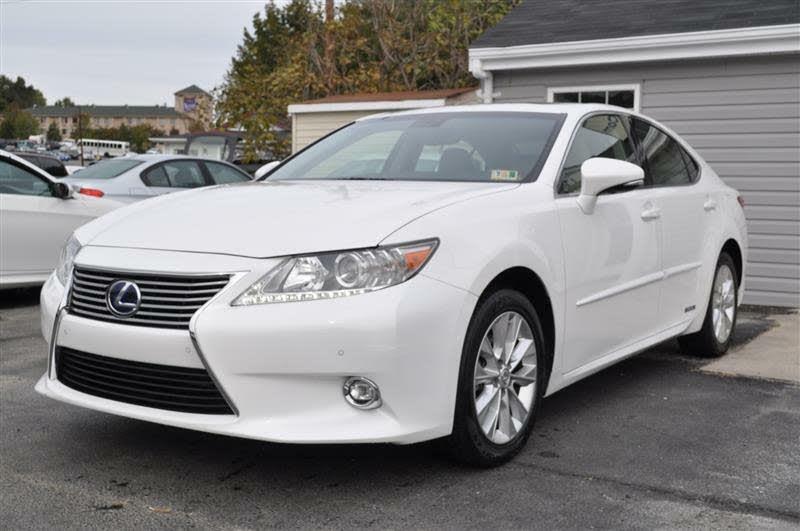 **ONE OWNER** 2015 LEXUS ES 300H with powerful 2.5L I4 DOHC 16V VVT-i engine and driven only 45535 miles! Fully loaded and much more! CARFAX CERTIFIED**FINANCING AVAILABLE** Contact our Sales at 703-634-2649//EMINENT WHITE PEARL EXTERIOR ON PREMIUM CHATEAU NULUXE W/LINEAR LIGHT MOCHA WOOD TRIM INTERIOR ES300H FWD SEDAN. THIS LEXUS IS FULLY LOADED WITH ON BOARD COMPUTER, BACK UP CAMERA, HAS DUAL POWER SEATS WITH LUMBAR SUPPORT, HEATED SEATS, POWER SUNROOF, NAVIGATION, DUAL AUTOMATIC CLIMATE CONTROLS, PUSH START, HEATED STEERING WHEEL, LEATHER WRAPPED WITH WOOD GRAIN TRIM , HID/LED LAMPS, PREMIUM PACKAGE WHEELS, BLUETOOTH CONNECTIVITY, PREMIUM AUDIO, HD RADIO. THIS ONE LOOKS AND DRIVES PERFECT, CALL TODAY TO SCHEDULE YOUR TEST DRIVE!! APPLY FOR PRE-APPROVAL FINANCING AT WWW.PURECARBUYING.COM. WE OFFER NATIONWIDE SHIPPING.Additional Information, A/C Front,Alloy Wheels,Anti-Lock Brakes,Compact Disc /AM/FM,Driver Air Bag,Dual Climate Controls,Heated Front Seats,Leather Interior,Leather Seats,Power Mirrors,Power Seats,Power Steering,Power Windows,Premium Sound System,Side Air Bag,Sunroof,Sunroof/Moonroof,Tilt Wheel,Traction Control,MP3 Player,Chrome Wheels,Backup Camera,Keyless Entry ,Bluetooth Connection,Passenger Air Bag,HID headlights,Backup Sensors,Rear Air Bags,Power Door Locks,Cruise Control,AM/FM Stereo,Heat/AC ,Auxiliary Audio Input,Multi-Zone A/C,Steering Wheel Audio Controls,Rain Sensing Wipers,Brake Assist// Please Visit Us At www.PureCarBuying.com. Message: Thought you might be interested in this 2015 Lexus ES 300h.